If you saw lumber for profit, you need a kiln. Timber-pro kilns are designed to give you many years of trouble-free service. The ½ hp. motors are all outside of the kiln environment and offered in single or three phase configurations. Venting is controlled by a “make-up air” fan controlled by pre-set parameter on the humidity. The vents are spring loaded to modulate the venting process according to demand. The kiln trucks are available in 4-6 & 8 ft lengths with 2-foot connectors providing easy loading and unloading of the kiln. The “VEE” wheels provide easy tracking on your flat bar rail attached to concrete or wooden ties. The height of the kiln will accept two 4-foot-high (1.2m) units. The walkway design provides baffling even with charge bottom and the top baffles are easily lowered with attached cables. The modular wall and ceiling panels of the kilns are made with HDO plywood and sealed between joints for an air & moisture-tight fit. All stainless-steel screw fasteners. The pre-fab 6-inch panels with ROXUL insulation are bolted together and attached to foundation with anchor bolts as are the roof panels to the top plates on the wall panels. The panels will require a lifting device to set in place. A small crane truck or loader to lift about 16 feet will be sufficient. The panels will be lifted in 8-foot sections and then bolted into place. 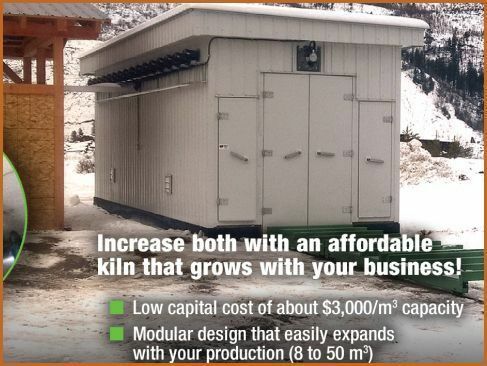 The kiln can be lengthened by adding modular 4 &/or 8-foot wall and roof panels and heating coils. The heating coils are ¾” copper -fin-tube elements fed from a 1.5” hot water manifold and are included. The door has been redesigned as a one-piece door with rubber perimeter seal is placed and removed with a rubber-tired carrier that is provided. A door at both ends is optional. The heat source plumbing and electrical hook-up is not provided. The electric control panel installation by your electrician is recommended to be included as part of or near the plumbing controls on the hot water boiler. You can use your own boiler or Timber-Pro can recommend a reputable supplier. Timber-pro will provide a minimum of 2 days supervision for the erection at cost if the customer wishes to use their own labor for erection and installation of the kiln components. Call or email your requirements today for a firm quotation. Call Timber-Pro today for a quotation on your requirements.